At Pain Physicians NY, a top rated pain management clinic in Brooklyn, NYC we offer you absolutely best osteoarthritis hip pain management options to prevent the progression of the hip arthritis. Our osteoarthritis hip pain management doctors and specialists effectively treat chronic arthritis of the hip. We have the most advanced, cutting edge equipment for osteoarthritis hip pain management. In our brand new state of the art facility we perform cortisone injections, osteotomy & total hip replacement surgery. Our Brooklyn osteoarthritis hip pain management specialists are best in region. We were selected to be a part of the international medical team for the Rio Olympic Games. Osteoarthritis (OA) is a degenerative bone condition which causes various joints of the body to become inflamed and swollen. Weight bearing joints of the body like hip and knee joint are the ones that are most commonly involved. 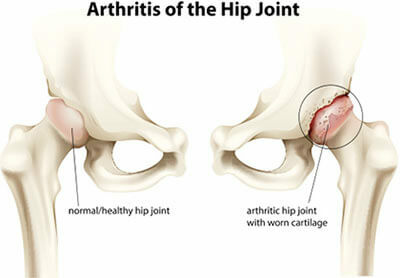 Osteoarthritis of the hip joint is a chronic, debilitating disease that adversely affects the daily life activities. Following is your guide for understanding the causes and management of this condition. Read on! Osteoarthritis of the hip joint results from the age-related degenerative changes that cause the structures within the joint, especially cartilage, to wear down. Cartilage is the structure that acts as a cushion within the joint. Erosion of cartilage causes the bones forming the joint to rub against each other, resulting in inflammation, redness and swelling and pain in the joint. Following are some of the most common risk factors for osteoarthritis of the hip. Aging: OA is most common after the age of 65. Obesity: Increased body weight puts undue stress on the joints, causing them to wear out early. Joint injuries: They are more common in people who engage in contact sports like rugby. Repeated trauma and healing process weaken the joint structure. Occupation: Certain occupations cause repetitive strain at the hip joint, causing it to deteriorate early. Genetics: Some people have a familial tendency for osteoarthritis. Bone deformities: People who are born with bone defects, like congenital dysplasia of the hip, are more prone to osteoarthritis of the hip joint. Since osteoarthritis is an irreversible disease, doctors recommend certain medications and lifestyle changes to cope with the disease and to minimize the morbidity associated with it. Doctors advise adopting the following lifestyle changes. If you experience hip osteoarthritis pain and haven’t found lasting relief through more conventional hip osteoarthritis treatments, medical marijuana treatment offered by our doctors may be right for you. Call marijuana treatment doctors of Pain Physicians NY with locations in Brooklyn, Queens, Manhattan and Bronx NYC to help you determine if medical marijuana treatment is right for your pain. Take the time to research and find a competent medical marijuana doctors in our marijuana treatment center in New York City. The right experience and knowledge saves you a considerable amount of time and trouble. The first step toward the lasting pain relief you need is as easy as making a single phone call to marijuana treatment doctor Boleslav Kosharskyy MD of Pain Physicians NY with locations in Brooklyn, Queens, Manhattan and Bronx NYC. Living with osteoarthritis of the hip can be difficult but with proper precaution and care, the symptoms of the disease can be minimized. The most advanced pain management center, Brooklyn osteoarthritis hip pain management doctors and specialists at Pain Physicians NY offer unique, individualized approach. We are using the most effective hip pain management options utilizing the latest technologies available in USA. The pace at which technology is growing can make last year’s methods obsolete. Our team is always at the top of their game and at the head of the pack.